To view 13 more pictures, interactive maps and the full, detailed description of the Eagle Pointe at Cahoon Plantation (55+) community, please Login. Active adults can enjoy condo living in new home communities like Eagle Pointe at Cahoon Plantation. Builders at this development took care of ensuring these stylish structures will be long lasting and low-maintenance. Conveniently located in Chesapeake, VA, this neighborhood offers residents city amenities without sacrificing the peaceful serenity of life amidst nature. Veterans can easily access the military bases of NAS Oceana, the Coast Guard Finance Center and Norfolk Naval Shipyard as well as the Coast Guard Exchange. Builders constructed this development with the active adult in mind. Spend time with loved ones or traveling, not tending to upkeep of houses. While some new home communities offer a limited selection of new homes, Eagle Pointe at Cahoon Plantation offers many. Choose from several models of homes in various categories like the Carriages II, the Cottages, the Verandas II, the Vistas and the Villas. Each condo has a floor plan that maximizes square footage. Living in a condo here has plenty of perks. 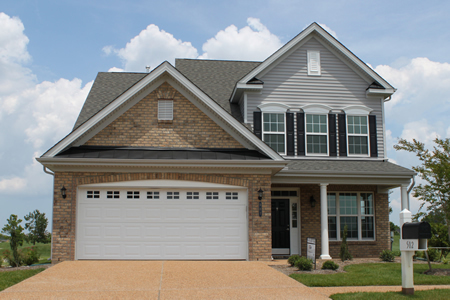 It is not all new home communities in Hampton Roads that offer all these amenities. Builders took great pride in creating the hub of activity in Eagle Pointe at Cahoon Plantation, the Bay Club. This is the place where residents play games, attend lectures, participate in workshops, take art classes, do yoga and more. Swimmers will adore the outside lap pool and indoor heated pool that will provide them a way to stay fit and trim. The 18-hole golf course at Cahoon Plantation can entertain golf enthusiasts for years to come. While Virginia affords some of the country’s finest scenery, Chesapeake is a true gem. Shopping, medical facilities, churches, banks, restaurants and entertainment are all around. Active adults 55 years and beyond will have no trouble staying on the go here. Take the binoculars and head to the Great Dismal Swamp State Park. Catch glimpses of migratory birds and rarely seen wildlife. Pack an early dinner and head to Bells Mill Park for a picnic. Age is only a state of mind, so keep yourself young by living a vacation lifestyle. Homebuyers can work with these builders to make sure that your condo is just the way you like. Eagle Pointe at Cahoon Plantation- active adult new home communities never looked so good. Send me more information about the Eagle Pointe at Cahoon Plantation (55+) new home community. Our agents gladly offer FREE property tours of Eagle Pointe at Cahoon Plantation (55+), Chesapeake and homebuyer consultations to all serious buyers.